The magic of India comes to life in Dr. Carrington's colorful look at the fables, feats, and magic of the mystical fakirs of India. You'll learn the inner workings of the Basket of Death, Mango Seed to Tree, Buried Alive illusion, Flying Rabbit, the Dry Sands Trick, the Beans and Scorpion Trick, Snake Charming, and more. Want to add something different to your act? Perhaps one of your primary assistants can adopt the role of a Hindu fakir and present one or two of these effects as an added attraction in your existing magic or hypnosis show. 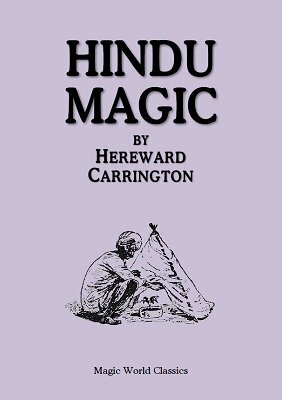 For magic historians, Carrington provides a rare glimpse of his own life in India in this book, with mentions of his father and sister also included in the text. 1st edition 1913; 1st digital edition 2017, 51 pages.